Meet the New Hampshire sisters. Hand raised but you sure wouldn't know it. They want nothing to do with me, unless it's morning and scratch is involved. They enjoy pushing their weight around the coop. 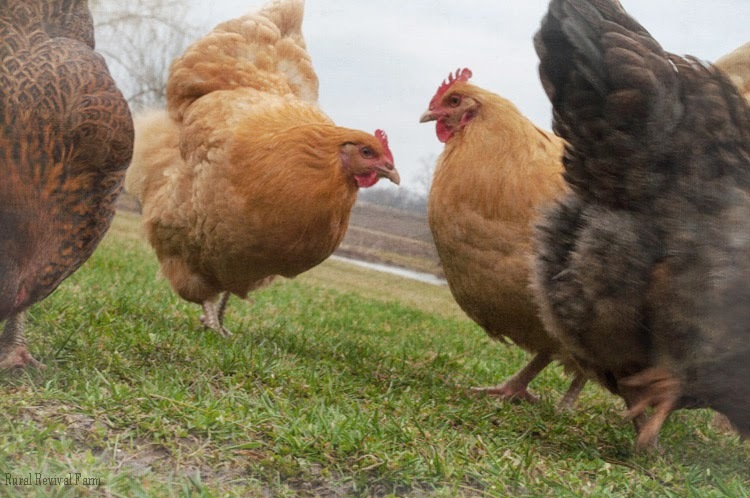 Being the largest hens has possibly led them to believe that they're in charge. Fortunately for the rest of the flock, and in particular Miss Pippy, Eli doesn't put up with such nonsense. He's worth his weight in gold, that fella. Still, I get the idea that they could be planning a coup. Maybe it's the way they quickly stop chatting to each other every time I come 'round. Conspiracy theorists have gone on less. ~Be well friends....and on the look out. We had a couple of those who pushed their weight around, in fact one was the same breed as the sisters. Love the shot! LOL! You do wonder what the sisters are up to. Fun post and love the shot. I think they have a plan and you aren't going to be included! They are beautiful hens! Love the color. that is funny, didn't know they had that much personality. Ha! The pecking order is alive and well on your place I see. Lovely hens. Love the hens'-eye-view of this photo! And the narration is perfect! Oh gosh, I am immediately transported back to one of my kids' animated movies (Chicken Run I believe) involving chickens and a coup to escape the farm. Oh yea, it could happen! Great photo. And thank you for my daily laugh. I would be careful around them. Who knows what they are up to. I have 2 N.H. sisters too. They almost honk like geese! Haha funny! Sounds like they're a bunch of spunky ladies! I want to eat those chickens.